In a peaceful setting, the house St Julien is available at any time of the year. You will appreciate its idyllic setting that combines green countryside and near the famous tourist site of Bayeux known for its tapestry, entertainment, museums, shopping and its unusual city center. At about 7 kilometers from the sea you can also enjoy the joys of swimming and visit the landing beaches. The cottage is open since July 2009, completely restored, independent and spacious property offers absolute comfort whatsoever bedding, furniture or appliances (kitchen, washing machine, barbecue, cot and high chair ...). You have a shower, but to facilitate the bath of little ones, we offer you a baby bath. Lovely accommodation which was very well equipped although bed linen and towels cost extra. Host were very helpful and nothing was too much trouble. Lovely place (a converted chapel) with a good garden, swings and slides for children, a covered seating area and animals (dogs, horses and donkeys) which kept our young children endlessly amused. Feels rural but you can walk into the centre of Bayeux in less than half an hour. There's a hypermarket just a few minutes' drive away and it's easy to get to the Normandy coast and D Day beaches from here. We arrived late on Sunday and hadn't really thought about supermarket opening times. Emmanuelle and Bernard kindly brought us some food. Bernard also made our son's holiday by taking our children up into the cab of his tractor. We had a great time here and we wouldn't hesitate to visit again. Beautiful Gite in beautiful surroundings. We really enjoy our stay at Le Logi Saint Julien. It is such a beautiful, clean, spacious Gite in beautiful surroundings. The perfect location to explore Bayeux and the history of the landing beaches. The owners are lovely and friendly and all of their pets are too! Such a relaxing place after driving and exploring every day. 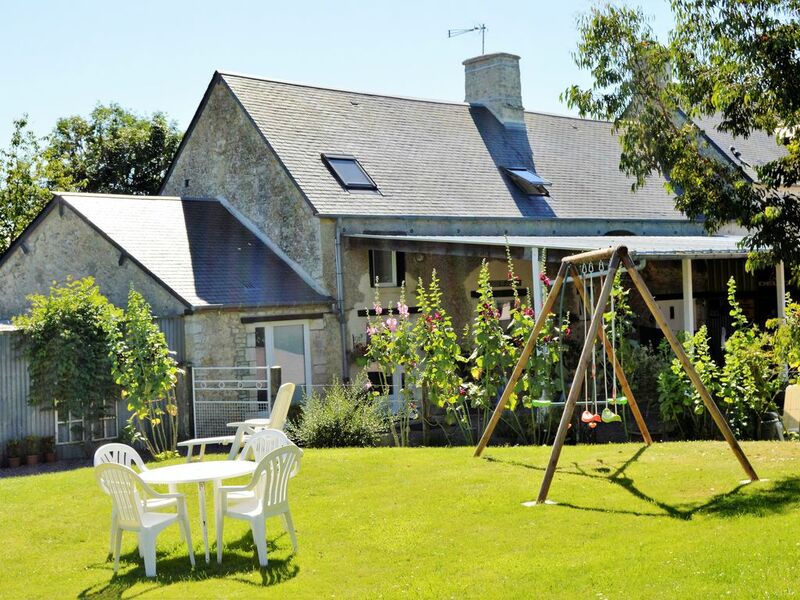 We can not fault this beautiful Gite in any way, it is just perfect. The owners were very kind to us and we thank them very much. We were left to enjoy our holiday in peace, however, nothing was too much trouble if we needed it. Tres tres tres tres bon! Merci beaucoup. C'est une propriété charmante. Un emplacement paisible et historique à la campagne, tout près de Bayeux. Emmanuel et Bernard sont des hôtes très sympathiques et nous avons apprécié la compagnie de leurs merveilleux animaux. Bravo Eden !! Nous recommandons cette propriété comme base pour explorer cette magnifique région. This is a lovely gite. Once an old chapel the owners have modernised it tastefully to a very good standard. There are two double bedrooms upstairs and a full kitchen and bathroom downstairs which contains a very good shower. Situated within a kilometre of Bayeux but in the countryside it provides the best of both worlds and a great base for exploring this most historic region. The owners Bernard and Emmanuelle are very nice people and their menagerie of animals are great fun something children would particularly enjoy. We had a lovely time here and will certainly consider it again the next time we visit the area. Sehr schön eingerichtet, alles sauber und ordentlich. Das Haus liegt etwas außerhalb von Bayeux, und es ist dort sehr ruhig, insbesondere in der Nacht. Nicht weit entfernt ist ein großer Supermarkt. Richtig gut französisch einkaufen kann man aber auf dem Markt in Bayeux, der Samstags vormittags stattfindet. Vom Standort aus sind viele Ziele in der Normandie und Bretagne gut erreichbar. Wir hatten auch noch das Glück, dass im Oktober 2018 dort wunderbares Wetter herrschte. Einfach traumhaft! Die Hausbesitzer sind sehr freundlich und können interessante Tipps zum Erkunden der Gegend geben. Auch der Hund, das Pferd und die zwei Esel sind freundliche Mitbewohner der kleinen Ranch. Wir haben die Zeit genossen und waren gerne dort! Équipement à revoir : literie, couverture, frigo, odeur forte de moisissure dans la cuisine et salle de bain, petit équipement ménager à améliorer et WC bouchés 1 journée. Environnement très calme et propriétaires accueillants. Très attentionnés au bien être de nos vacanciers, nous n'avons pas compris ce commentaire visiblement mal veillant. Notre literie est toute récente, les couvertures s'y rapportant sont également régulièrement lavées. Quant à d'éventuelles odeurs de moisissures dans la pièce principale (identifiée comme cuisine par pasquale c., nous vous invitons à consulter l'ensemble des photos totalement contractuelles) cela ne correspond absolument pas à la réalité : chaque année nous effectuons des travaux de réfection peinture et absolument aucune moisissure n'est présente dans notre gîte !!! D'une part nous vous informons que nous venons d'obtenir le label préfectoral 2 étoiles . D'autre part, nous vous proposons de consulter l'ensemble des commentaires liés à notre gîte, qui ont toujours été positifs !!! !